Second course came in the shape of a tremendous little carpaccio. 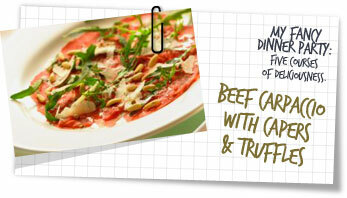 I’d never had carpaccio of beef and was keen to try it. It’s incredibly easy to prepare and visually it’s a real crowd pleaser. Taste wise, the truffles add their magic in a big way. Their unique taste is great alongside the freshness of the beef. Fabulous. 1 truffle (thinly shaved) or use truffle oil if you can’t get fresh truffles. Heat a frying pan till how with a little oil, sear the meat on all sides for 10 seconds until brown remove then leave to cool. Wrap tightly in plastic wrap then freeze for 30 minutes. Decorate the beef slices with the capers, shallots and rocket. and two tablespoons of the caper vinegar. Season with salt & pepper. Sprinkle over the shaved truffles then drizzle a extra virgin olive oil. If you are using truffle oil, just drizzle over the oil instead of olive oil. Serve with lemon wedges for your guests to squeeze if they wish.